I am taking the current bounce in the dollar as a chance to purchase oil as it pulls back into support after breaking out of its recent range. As followers of TWS know full well, I believe the dollar has long way to fall and commodities are some of the only assets with improving fundamentals. Oil based below the $73-74 resistance level for months but successfully broke out in mid-October and cruised up over $82 per barrel. The bounce in the dollar has brought selling back to the commodity as it pulls in to retest the recent breakout. I want to be long oil against the $73 level. I have been watching crude oil for a long time but had never found a good way to play the idea. Gold is my other core long position and I am playing it through the GLD ETF. GLD is probably the best possible type of ETF because it actually holds physical gold to back the shares issued. Crude oil is another story as it is obviously difficult to own big pools of oil. Therefore, oil ETFs typically suffer from contango as I outlined back in June. So while oil is trading up over 70% year-to-date, the largest oil ETF by volume (USO) is up a paltry 20.3% YTD. Contango is an annoying dynamic in trading futures contracts but some ETFs do a better job of managing it than others. 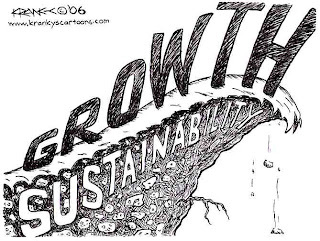 USO depends solely on the front-month contract making it particularly susceptible to contango and, in turn, a relatively bad long-term investment. I recently found a new ETF which I will use for my investing in oil. The PowerShares DB Oil Fund (DBO) is up 42.2% YTD, obviously doing a better job of tracking movements in the oil market. 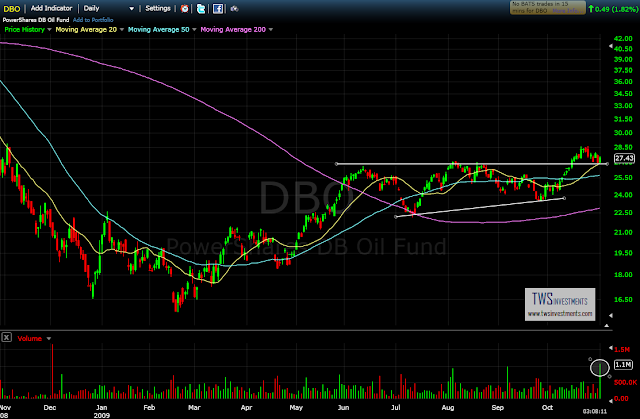 I am buying my first bit today as DBO saw a large uptick in volume against the $27 support level. This initial position is small and I am watching to see if the volume is forecasting a bottom to this pull-in. 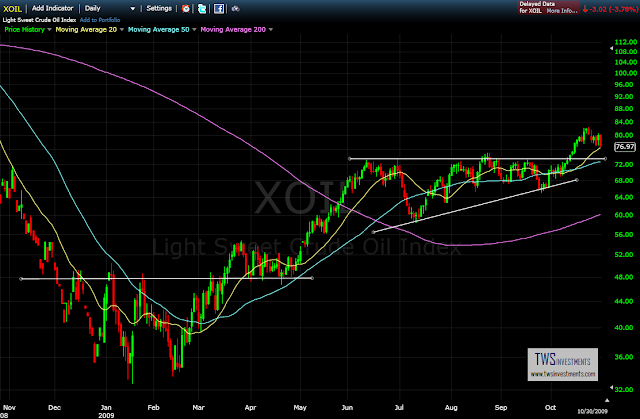 I believe that after 4 months of sideways action the crude oil market has renewed its uptrend. My stops are at the $25.50 area for a maximum 8% loss on my initial position. I will add on strength. When and where are you holding this position until? And kudos on discovering DBO! Thanks! I am looking for a trade to roughly $100 per barrel. Quick measurements would say 40 to 70, breakout of 70 puts it up to 100. I'd expect this to take several months and I'll add on strength and attempt to take profits along the way.